A sever taper and a shallow planting area are the main accents of our Low Wok Bowls. With very little of the pot sitting on the ground, the bowl looks like it is floating. 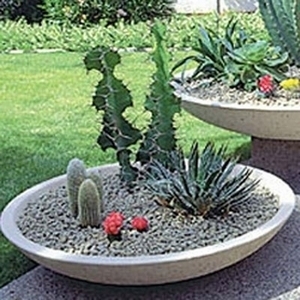 Filled with spring flowers, succulents, or cactus it adds design and beauty to your landscape. Our concrete garden pottery is manufactured in Arizona using a high-quality concrete mix and molding process. This secret concrete mix includes a volcanic rock harvested in Sedona, Arizona. Compact, durable and available in 15 color choices make these planters the perfect containers for any Home & Garden project. Each mix is colored before pouring so any future chips will be hardly noticeable. Choose your color, your finish & your drain hole preference and we will have your planters manufactured just for you!